I may have mentioned this before, but I am a biscuit fanatic. They are on my list of 5 favorite things to eat. Do you ever think about what your top 5 things to eat are? In addition to biscuits, my other faves are brownies, spaghetti, prime rib and sushi. Ohhhhhhhh, but then there chips and salsa too. Hmmmmm, ok, so let’s make that 6 favorite things to eat!! If you feel like sharing your top 6 things, let’s hear it! Anyway, back to the biscuits……. My sister is also a biscuit fanatic. Guess it was our upbringing. 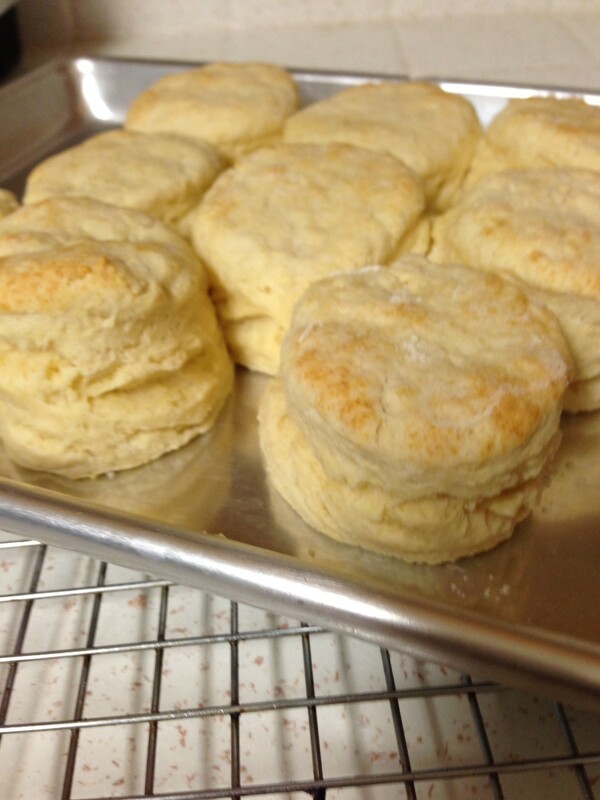 My dad always made biscuits. 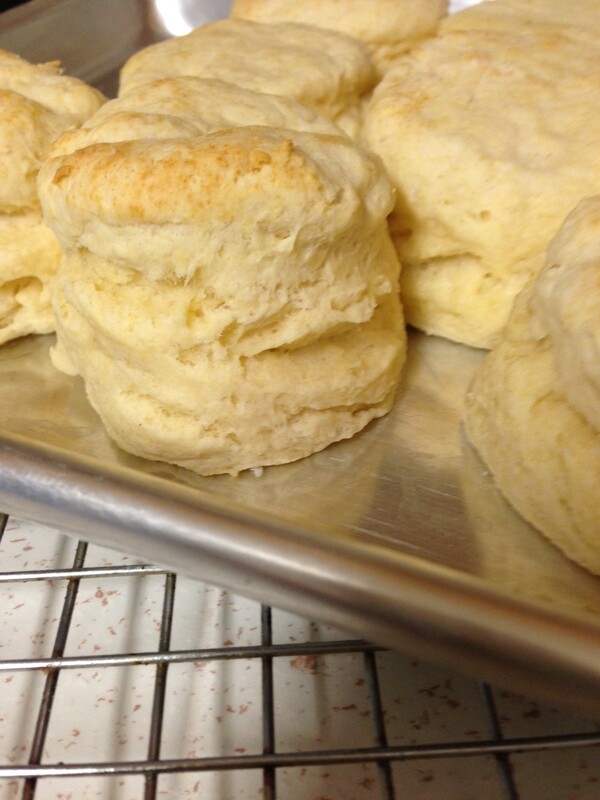 Biscuits with jam, biscuits and gravy, honey butter biscuits….we always had good fluffy biscuits with our meals. 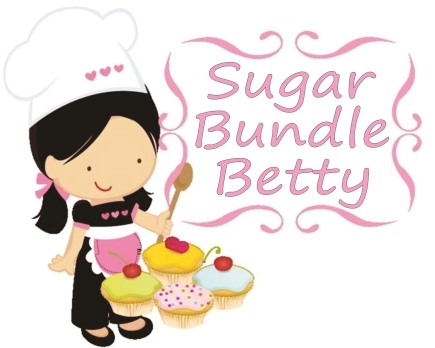 I will be posting the honey butter biscuits soon. Oh boy, they are decadent. Preheat oven to 425. Combine dry ingredients. Add shortening or butter and cut into small pieces till resembles course meal. Add egg/milk mixture and stir into dry ingredients gently. Turn unto floured surface and work gently for a moment until dough looks smooth. DO NOT OVERHANDLE. Roll out 1/2″ thick and cut with a round biscuit or cookie cutter. Just use a glass if you dont have a cutter. Plop em on a baking sheet and bake 8-10 minutes until barely brown. Makes about 8 biscuits. Or if you prefer a bigger biscuit, cut them bigger. 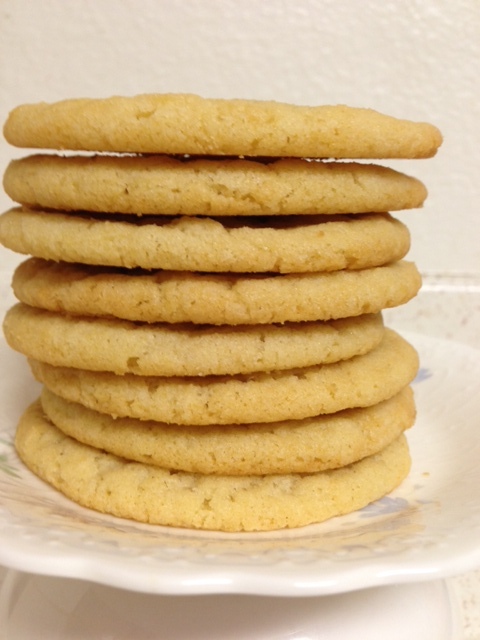 A good ol sugar cookie…scrumptious…..
Usually when I want cookies, the first cookie that comes to mind, is a good chocolate chip cookie. But sometimes I want a non-chocolate cookie. But it still has to be chewy, crispy and buttery. This is that cookie. 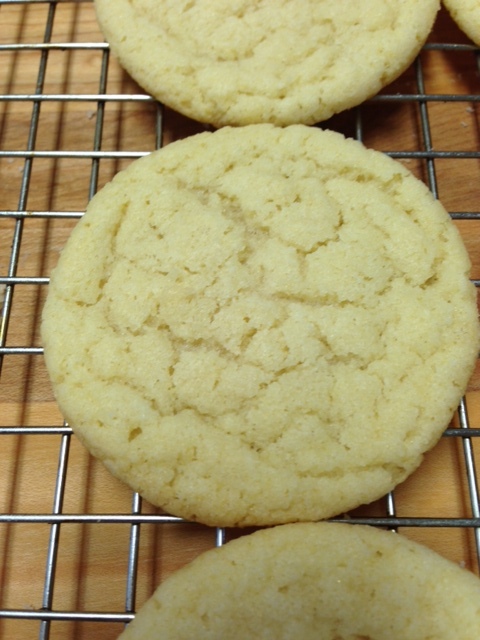 I’ve tried several recipes and came up with this one that I think may be my favorite sugar cookie so far…..for now…maybe….but I am still experimenting. This one is kinda like a snickerdoodle without the cinnamon. I love the crackles on the surface, don’t you? I get so excited when I see those!!! This is not a sugar cookie made for rolling out and painting. This one is to stack on a fancy little plate and snack on…one right after the other. Stack and snack!! 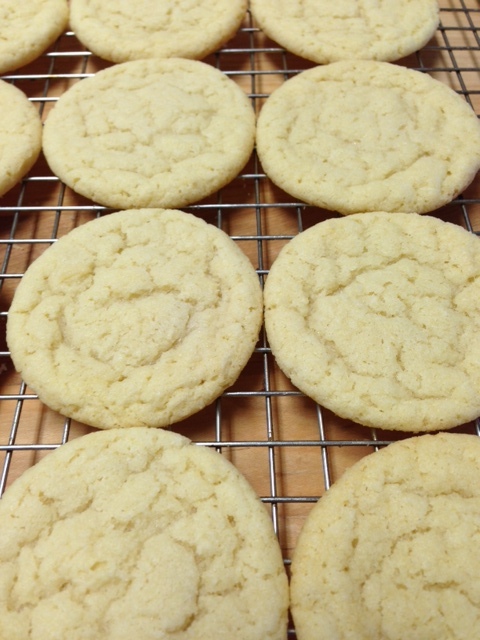 Hey, I like that…….I will call these Stack n Snack Sugar cookies. You just gotta make these. I promise you will love them and eat lots of them. Stack them high on your plate and chomp, chomp, chomp away!!! preheat oven to 350. In a mixer, cream the butter and the sugar. add the vanilla and egg. Mix till mostly smooth. Add the dry ingredients. add the sour cream and the milk. you should have a smooth soft dough. Roll into balls that are not too small but not big…..slightly bigger than an inch and a half. Place them on a parchment lined baking sheet, preferably. Bake for 6 minutes and then turn pan and bake for another 6 minutes or just till you notice the edges getting very light brown. let cook on sheet. If you want to make bigger cookies, just increase baking time. By the way, these make excellent ice cream sandwiches. I am not much of a cole slaw person. I don’t like all that runny mayo….sweet yuckiness. 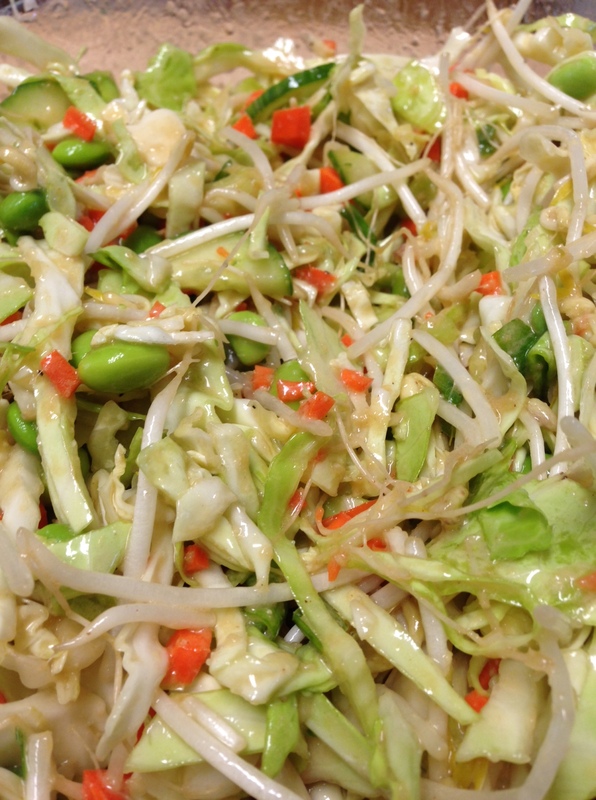 But I do however, love asian slaw. It’s light, crunchy and goes well as a side dish, or on a sandwhich or you can add some chicken and it’s a meal. It is just crunchy goodness and easy to put together. I hope you will try it. toss everything together in a large bowl. Pour in some Asian dressing, chill and enjoy! That simple!! 1 tsp of chili paste (if you like spicy) I do!!! put everything in a food processor or blender.. add salt to taste. ready to go. 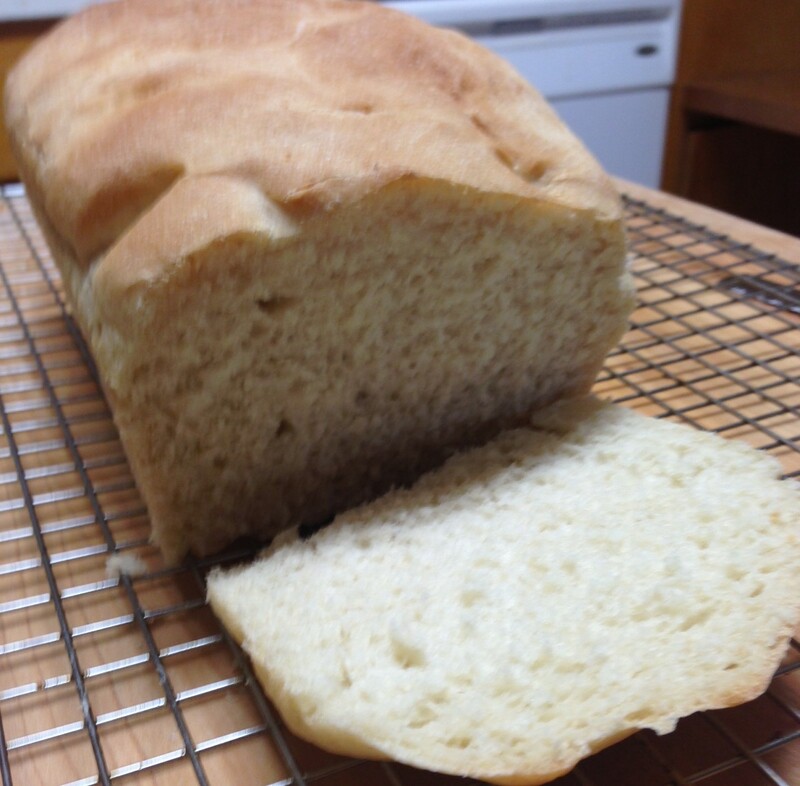 A great sandwich, toast or French toast starts with really great bread. I love bread. I love a good samich made with really good homemade bread. 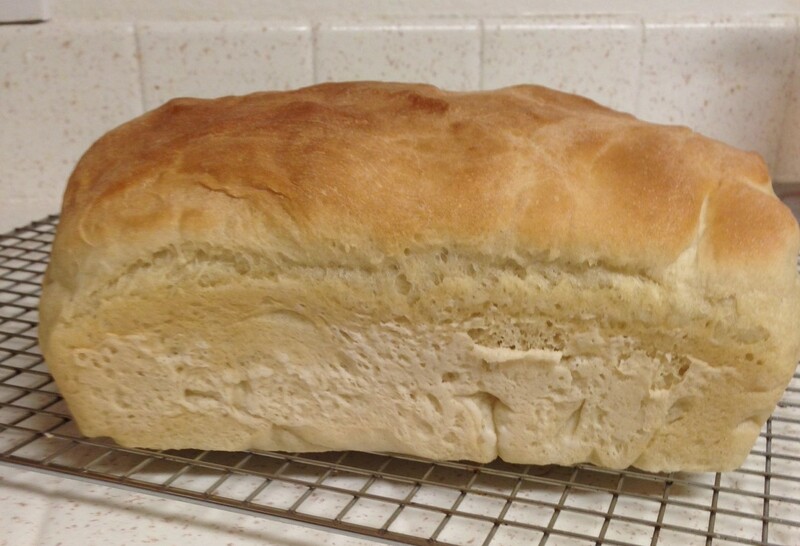 Today I baked homemade bread. Not sure what kind of samich I will make yet. Hmm-m-m-m…..maybe a chicken salad. Maybe a BLT. Yummy. It is super simple, delicious, melt in your mouth. I know a lot of people are afraid to work with yeast and doughs. But don’t be scared……fear not!! This recipe is super easy. 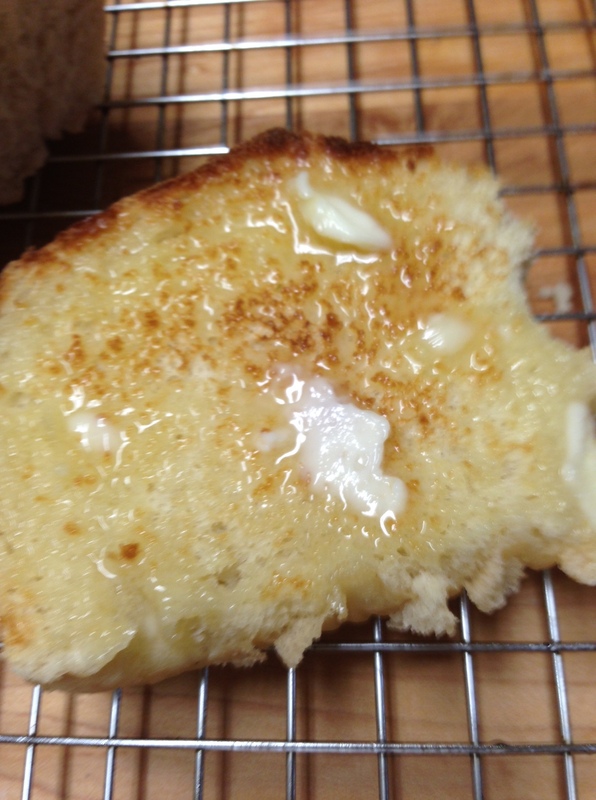 It has a really tender crumb, holds up well to all of your samich fixins and it is very toast-able. Is that a word? Anyway, I’m telling ya, you gotta try this. In a large standing mixing bowl, mix together the hot water, oil, honey and salt. **Add about 1/2 cup of the flour ** to the water mixture. Mix for a few seconds. Add the yeast and mix for about 20 seconds. Switch to a dough hook if you are using a standing mixer. Add enough of the remaining flour, to get a soft dough that all comes together around the hook. You may not need all of the flour. The dough should be soft but not sticky. Continue for about 6 minutes on a medium low speed. Remove the dough from around the dough hook and place the dough ball into an oiled bowl. Cover bowl and let rise for 30 minutes in a warm place. Once the dough rises, heat the oven to 175 degrees. Grease your bread pan with oil. Place the dough in your bread pan, slightly stretching out to fit pan. Place loaf in warm oven for about 1/2 hour or until the dough rises to fill the pan. Then turn the oven up to 350 degrees and cook for about 30 minutes. let it cool, remove from pan and place on baking/cooling rack. 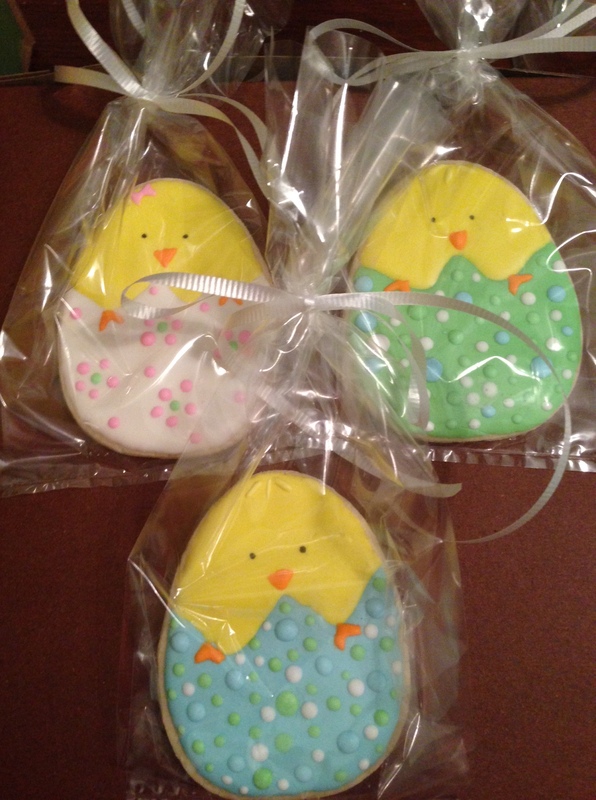 I have been busy painting Easter cookies this week. My favorite cookies to paint….but I am so happy to be finished! 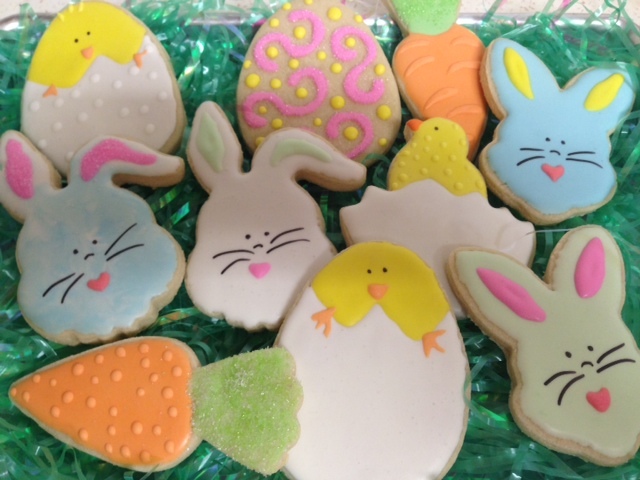 I painted 245 cookies and I even dreamed about Easter bunny cookies last night. 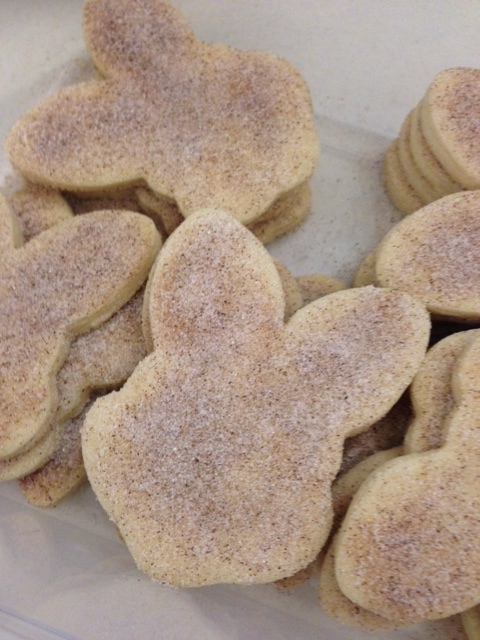 I was going to paint a bunch of bunnies to take to the office today, but I was so tired of painting, that I baked them and then coated them with cinnamon and sugar. We called them Snickerbunnies and cinnabunnies. Cute, huh? Thank you to those of you who ordered cookies from me. I hope you all enjoy them. I’ve posted pictures of some that I painted. I hope everyone has a wonderful Easter weekend.